Are you passionate about marine animals and the environment? Do you want to get others interested in saving aquatic species? Do you just think sharks are cool? The Center for Aquatic Sciences at Adventure Aquarium offers several opportunities for those who want to volunteer and become an integral part of our mission, which is to promote the understanding, appreciation and protection of aquatic life and habitats. We place volunteers in a number of areas. Volunteer divers educate aquarium visitors and assist with exhibit maintenance. 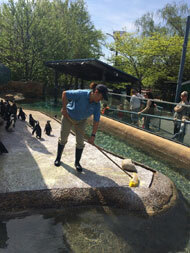 Volunteers also support the Husbandry team with food preparation and animal enclosure cleaning. Center volunteers facilitate educational activities that inspire everyone to do all they can to save species around the world. You don’t need to be an oceanographer or biologist, but you must be enthusiastic, dedicated and willing to get involved. Volunteers must be 18 years or older except for certain Center volunteer positions..
All volunteer positions require a time commitment of at least 16 hours each month, usually for a minimum of 12 months. Some positions have additional requirements (i.e. dive volunteers must possess SCUBA certification). Volunteers must have good communication and interpersonal skills. Due to the high volume of requests, we are unable to arrange job shadows or short-term volunteer opportunities at this time. Visit Center Teen Programs for information on high school job shadows. Work with talented, dedicated individuals devoted to bringing the important message of conservation of our aquatic resources to our aquarium guests. Go to Volunteer Opportunities to see the volunteer positions that are available. Not all opportunities are a good fit, so please read the position descriptions and requirements carefully before submitting an application. Applications are accepted any time online only. Once an application is received, it will be reviewed for position availability. If a position is available and the applicant meets the necessary requirements, the application will be forwarded to the appropriate department manager. If there are no positions open, the application will be kept for 6 - 8 months. Applicants will be contacted if a position becomes available during that time period. Email volunteer@aquaticsciences.org with questions or for more information.